Dr. Craig Hartrick discusses the many unanswered question regarding the use of steroids in pain management. The discrepancies in data include efficacy, risk vs. benefit, and patient selection. He explains the many complicated variables that can affect the anti-inflammatory properties of steroids at the cellular level. This includes the receptor-mediated, nuclear translocation process by the glucocorticoid and the subsequent transcription cascade of inflammatory mediators. 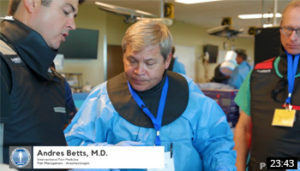 Dr. Stephen Barrett discusses the instruments in the Bioness StimRouter kit before demonstrating how to implant the device adjacent to the common peroneal nerve. He first locates the nerve with palpation and ultrasound, and with blunt dissection, he uses tools provided in the kit to advance the lead to cover the nerve. He then sutures the opening and shows the placement of the battery patch. Dr. Ira Fox demonstrates how to perform a lysis of adhesion procedure on a cadaver via caudal approach (through the sacral hiatus). 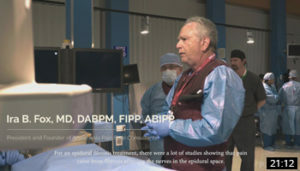 Before the fluoroscopic guided procedure, he explains in great detail the efficacy of the procedure for epidural scarring, the importance of anterior-lateral catheter placement, and the injectates/volumes used. Dr. Candido explains the importance of evidence based medicine and following guidelines to minimize complications from ESIs. 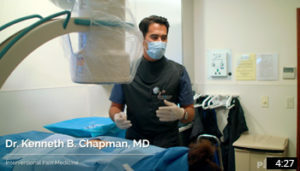 He compares different techniques used to access the epidural space along with different imaging modalities. 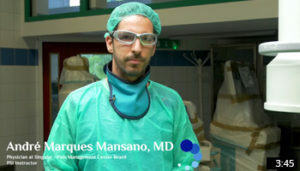 Dr. Candido also discusses ways to minimize infections associated with implantable devices. 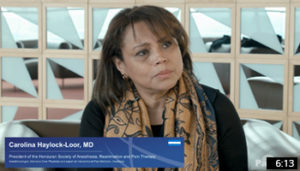 Dr. Carolina Haylock-Loor briefly discusses how the World Federation of Societies of Anesthesiologists (WFSA) global presence – representing 150 countries and the WHO – raises the standards for anesthesiologists. 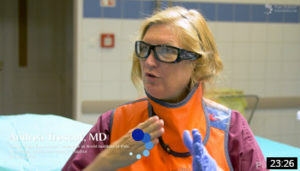 One example of how the WFSA is improving anesthesiology is its recent publication, “International Standard for a Safe Practice of Anesthesiologists”, which she co-authored. Dr. Stephen Barrett discusses the instruments in the Bioness StimRouter kit before demonstrating how to implant the device adjacent to the common peroneal nerve. Dr. Ira Fox demonstrates how to perform a lysis of adhesion procedure on a cadaver via caudal approach (via the sacral hiatus). Dr. Stephen Barrett talks about his experience in treating peripheral neuropathies in the lower extremity using the Bioness StimRouter. 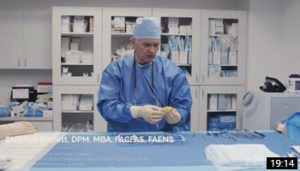 Dr. Sudhir Diwan talks about his approach to pain medicine with the use of his office, surgery centers, and hospitals. 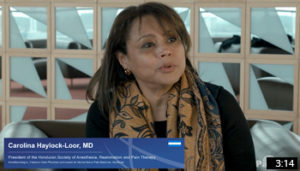 Dr. Carolina Haylock-Loor briefly discusses how the World Federation of Societies of Anesthesiologists (WFSA) global presence. Dr. Andrea Trescot teaches students at the Pain School International how to implant a spinal cord stimulator. 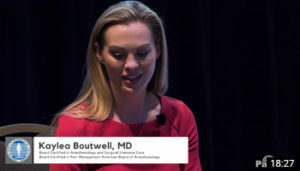 Dr. Haylock-Loor discusses how important the lysis of adhesions procedure has been in treating her patients. 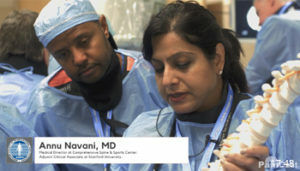 Dr. Annu Navani demonstrates how to perform sacroiliac injections in a cadaver lab. Drs. 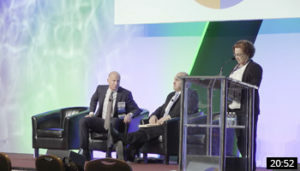 Boutwell, Cordner, and Bakshi, as a panel, answer questions on the struggles and rewards of running a private practice. 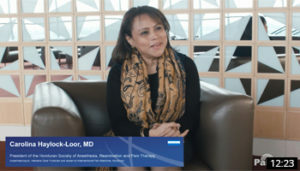 Dr. Haylock-Loor, President of the Honduran Society of Anesthesia, discusses the Adhesiolysis procedure in the cervical spine, and the successful outcome she encounters. Dr. Stephen Barrett demonstrates two different approaches for lead placement of the Bioness StimRouter for tibial nerve stimulation. 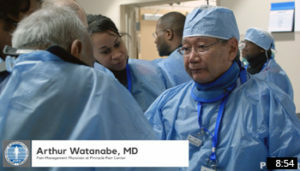 Dr. Arthur Watanabe demonstrates how to perform a thoracic rhizotomy on a cadaver. 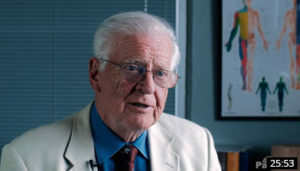 Dr. Harold Cordner demonstrates a two-needle technique for a lumbar discogram. 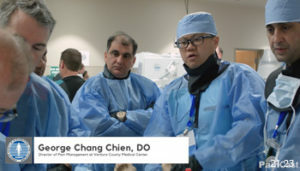 Dr. George Chien demonstrates how to visualize the plantar fascia and the Achilles tendon of the foot under ultrasound. 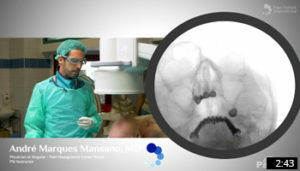 Dr. Andre Marques demonstrates, using a cadaver, how to perform a trigeminal ganglion block/RF procedure. 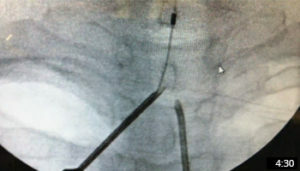 Dr. Kenneth Chapman performs a sacroiliac (SI) injection with the aid of fluoroscopic guidance. 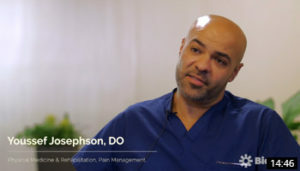 Dr. Youssef Josephson performs a live Bioness Stimrouter PNS implant to treat neuropathy of the Lateral Femoral Cutaneous nerve caused by a previous total hip replacement. 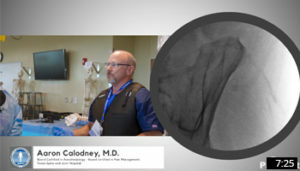 Dr. Aaron Calodney demonstrates the proper technique to access the ideal portion of the iliac crest for obtaining bone marrow aspirate. Dr. Andres Betts demonstrates how to properly advance the cannula for a mechanical lumbar-kyphoplasty. 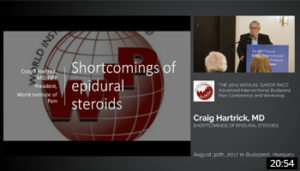 Dr. Craig Hartrick discusses the many unanswered question regarding the use of steroids in pain management. Dr. Candido explains the importance of evidence based medicine and following guidelines to minimize complications from ESIs. 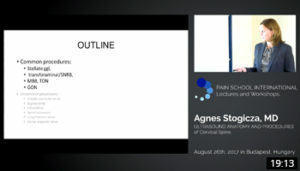 From Pain School International, Dr. Agnes Stogicza gives a presentation on the use of ultrasound to better identify structures related to the cervical spine. Dr. 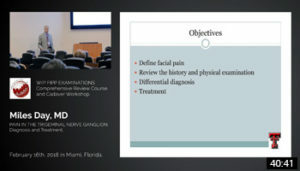 Miles Day discusses both the trigeminal ganglion and sphenopalatine ganglion block as treatments for facial pain and headaches. 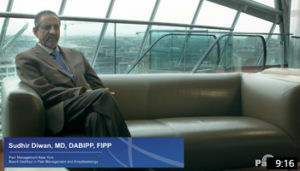 Dr. Monique Steegers explains her role as a FIPP exam monitor, and how her experience in research helps to ensure the exam is always current and evidence based. 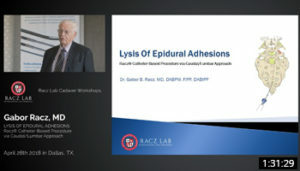 Dr. Gabor Racz gives a technique-based slide presentation on the Lysis of Adhesion procedure. 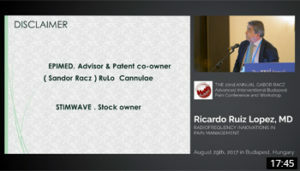 Dr. Candido moderates a panel consisting of Drs. Buenaventura and Glaser on various topics comparing the safety and efficacy of many ESI techniques in the lumbar and the cervical spine. 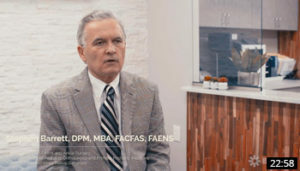 As a FIPP examiner, Dr. Milan Stojanovic has a unique view on the World Institute of Pain (WIP). 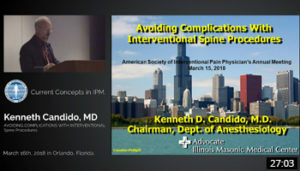 Dr. Ruiz Lopez speaks about the importance of Interventional Pain as a specialty in today’s society, especially with such an overuse of opioids. 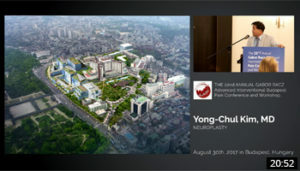 Dr. Yong-Chul Kim gives a detailed slide presentation on neuroplasty to show the evidence-based efficacy of the procedure. 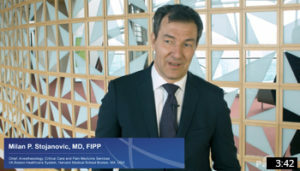 Dr. Gabor Racz talks about his involvement in discovering the benefits introducing hypertonic saline in the epidural space after a lysis of adhesion procedure. 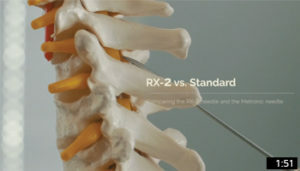 Dr. Racz compares the use of the typical introducer needle to the RX-2 Coude needle for inserting spinal cord simulators. The standard needle is similar to that of a Tuohy and has a curve in the tip. Dr. Racz reviews a few key points to conclude his discussion on the use and advantage of the RX-2 Coude needle, not only for efficacy but also patient safety. 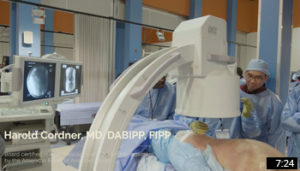 Dr. Racz offers simple yet important "tips" when positioning a patient in the prone position for optimal fluoroscopic viewing of the spine. 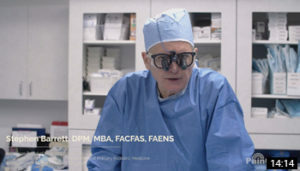 Dr. Racz compares the safety of RX-2 Coude needle to other needle by demonstrating the use of the second, atraumatic stylet. 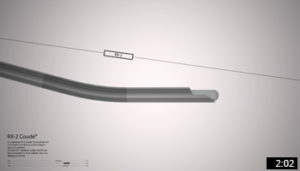 Dr. Racz explains the advantages of using the RX-2 Coude needle when advancing cervical stimulator leads compared to that of a Tuohy needle. By using the Blunt RX Needle in the cervical spine, the patient is free to perform flexion with rotation motions without the risk of puncturing the dura and other structures. Dr. Racz adds a side note about the RX-2 Coude. 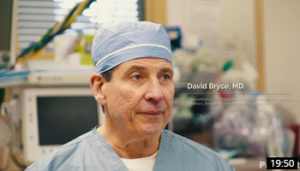 He explains why both physicians and sales reps recognize the proven safety of using this needle with the secondary stylet. Dr. Ralph Justiz explains the benefits of using the fiXate™ anchoring system to secure SCS leads as opposed to using sutures. 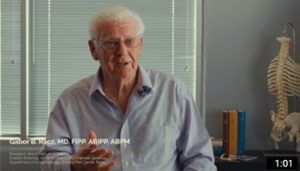 Dr. John Nelson explains the development of the Double Nelson extension set from hearing of previous disasters of transformaminal epidural steroid injections. Dr. Bryce talks about his new study on pain and population medicine, which will soon be published. Meredith George, Director of Physician Services, provides information regarding billing, coding, and practice management updates. Director of Physician Services, Meredith George, explains the importance of writing a letter of predetermination to insurance providers to verify coverage of certain medical procedures.